YORKTOWN HEIGHTS, N.Y. and MADRID,	- 30 Oct 2014: Scientists at IBM (NYSE: IBM) and leading global energy company Repsol S.A.(REP.US) announced today the world’s first research collaboration to leverage cognitive technologies that will help transform the oil and gas industry. IBM and Repsol are jointly developing two prototype cognitive applications specifically designed to augment Repsol’s strategic decision making in the optimization of oil reservoir production and in the acquisition of new oil fields. The oil and gas industry boasts some of the most advanced geological, geophysical and chemical science in the world. However with the explosion of big data and emerging science, the discovery, mining, integration and interpretation of this data, together with critical geopolitical, economic and other global news, require a whole new approach to computing that can speed access to business insights, enhance strategic decision-making and drive productivity. Using the capabilities of IBM’s pioneering Cognitive Environments Laboratory (CEL), Repsol and IBM researchers will work together to jointly develop and apply new prototype cognitive tools for real-world use cases in the oil and gas industry. Cognitive computing software agents and technologies will be designed to collaborate with human experts in more natural ways, learn through interaction, and enable individuals and teams to make better decisions by overcoming cognitive limitations posed by big data. Scientists in the CEL will also be able to experiment with a combination of traditional and new interfaces based upon spoken dialog, gesture, robotics and advanced visualization and navigation techniques. Through these modalities, they will be able to learn and leverage sophisticated models of human characteristics, preferences and biases that may be present in the decision-making process. For example, an engineer evaluating what new oil fields to acquire will typically have to manually read through an enormous set of journal papers and baseline reports with seismic imaging data and models of reservoir, well, facilities, production and export. Cognitive technologies can quickly help by analyzing hundreds of thousands of papers and reports, prioritize and link that data to the specific decision at hand, and introduce new real-time factors to be considered such as current news events around economic instability, political unrest and natural disasters. Using the research tools in the CEL, the engineer along with key stakeholders can more fluidly build conceptual and geological models, highlight the impact of the potential risks and uncertainty, visualize trade-offs, and explore what-if scenarios to ensure the best decision is made. The two prototype applications that will be jointly developed by IBM and Repsol will leverage cognitive computing capabilities to specifically help Repsol reduce the risk and uncertainty of future oil field acquisitions and maximize the yield of existing oil fields – both of which can have a significant impact on the efficiency and efficacy of the global operations of Repsol and all oil and gas companies. “Repsol’s technological research and applications have already helped us significantly improve the way we visualize and develop oil and gas fields, and this latest collaboration with IBM opens up a whole world of new possibilities. We are convinced that the seamless blending of technology and talent will be the key driver for the industry in the 21st Century, where efficient management of resources is paramount,” said Santiago Quesada Garmendia, Director of E&P Technology for Repsol. Global energy demand is expected to grow by more than 53 percent by 2035, with more than half of that energy being supplied by oil and gas. In order to maintain an energy supply for years to come, companies are constantly making high-stakes decisions in the face of uncertainty and risks, while the volume of complex data is growing exponentially. Decision making doesn’t happen only in one place and often it requires people to regroup with more information or new stakeholders to be involved before arriving at an outcome. As people work and move across many physical environments, it is important for people to have access to cognitive capabilities in a seamless computing experience whether it’s at the office, at home or in the field. Such a fluid cognitive computing experience will be possible with a cognitive environment infrastructure that provides a new class of cognitive software agents and services designed specifically to interact with people across various devices and physical spaces. As users move from strategic cognitive rooms to their offices and even homes, a society of cognitive agents will move seamlessly with them across these environments and different modes of interaction and computation will scale appropriately to each. Cognitive environments can look and feel very different (from board rooms in the workplace, to cars, to homes, to mobile devices), but by being connected to one another they will enable human-computer collaboration at “the speed of thought”, leading to more informed and robust decision-making. Santiago Quesada Garmendia will discuss this research collaboration at IBM’s annual Cognitive Systems Colloquium, being held today at IBM’s Thomas J. Watson Research Center in Yorktown Heights, NY. He will unveil initial insights of a prototype cognitive environment and tools, which are being jointly developed with IBM for specific oil and gas industry applications. The event, attended by academics, researchers and IBM clients and collaborators, will focus on how the new era of cognitive computing will deliver the next level of advanced collaboration between people and computers to augment human intelligence, boosting the productivity and creativity of individuals and teams, and thereby transforming industries and professions. 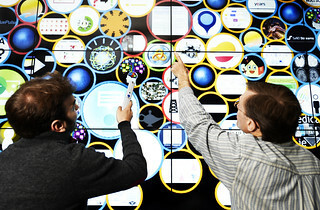 For more information, please visit www.research.ibm.com. Repsol is a Spanish integrated oil and gas company present in over thirty countries, employing 24,000 people. The company is the market-leader in refining and marketing in Spain and has a worldwide daily production of 346,000 barrels of oil equivalent. During the last decade Repsol has reinvented itself from being specialized in refining by growing a large exploration and production business, which since 2004 has posted more than 50 discoveries, eight of which are amongst the world's largest. The Repsol Technology Centre is one of the largest technological investigation centres in Europe, with a myriad of projects to boost exploration and production activity by applying ground-breaking technology. Its award-winning Kaleidoscope seismic imaging project, developed together with IBM, proved to be a breakthrough in mapping pre-salt oil formations, and the company’s multiple technological initiatives in oilfield mapping and modelling have improved safety, efficiency and profitability in its operations. Repsol’s expansion strategy envisages industry-leading production, reserves and earnings growth throughout the next decade thanks to the successful start-up of new fields and a strong exploration pipeline.